How many days or hours have you spent cooking in your mom’s kitchen before you left to pursue higher education or got married and moved to different city/state/country? I am talking about whole cooking process which includes peeling, trimming, chopping, grinding, cooking and also cleaning the whole mess you have made. Is it years, months, weeks, days, hours or just few minutes? If I were to include everything, then the fingers in my hands will be enough to do all the calculations. Growing up in India, kitchen was my Amma’s territory. Sometime I would help my mother in peeling the potatoes or chopping the beans. Other times I helped her in roasting the spices and grinding them. And when I was too lazy to do anything I declared myself as a certified quality control officer by tasting and testing for salt and spices. And embarrassingly I was not even good at that as many a times I failed to figure what was missing in the dish; whether it needed a sprinkle of chilli powder or dash of lemon juice. ‘Little bit of this and little bit’ of that is what we call ‘andaJu or andaz in cooking’ and little did I know it all comes from experience! After moving to UK and sampling few foods cooked by my dear husband I realised that I needed to improve my culinary skills if I were to eat different kinds of food which will also taste differently. Krish is a good cook but his culinary skill is limited to making a bowl of Rasam and Sambar using the same curry powder which was used in almost all the curries he made. I can’t blame him completely as his pantry was stocked with a bottle of all purpose curry powder, dried Italian herbs and a jar of dried coriander leaves. You can hardly cook any curry with them, let alone authentic ones. That was the time I decided to learn cooking seriously. To my surprise I was blessed with beginners luck when it came to cooking and luckily some how most of the things I cooked tasted good if not best. After countless late night overseas SOS calls, few burnt pans and some over cooked veggies with little extra dose of spice and salt, I was blessed by goddess Annapurna and rest all, as we say, is a history. 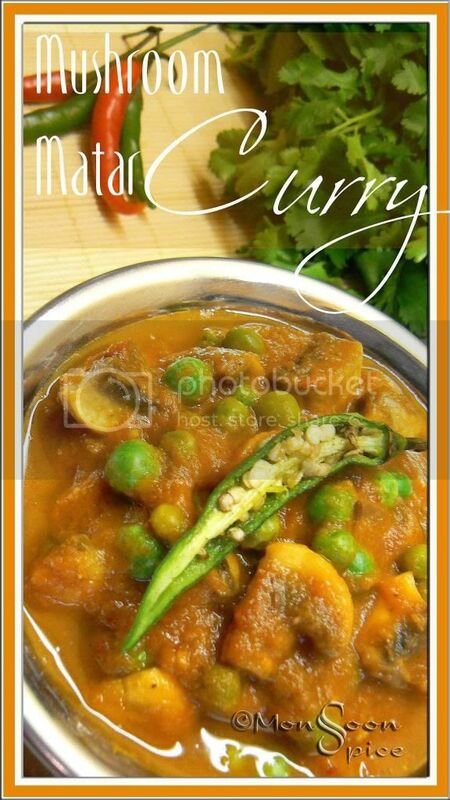 Today’s recipe of Creamy Mushroom-Matar Curry is a result of my successful cooking experiments which seems to be increasing these days. 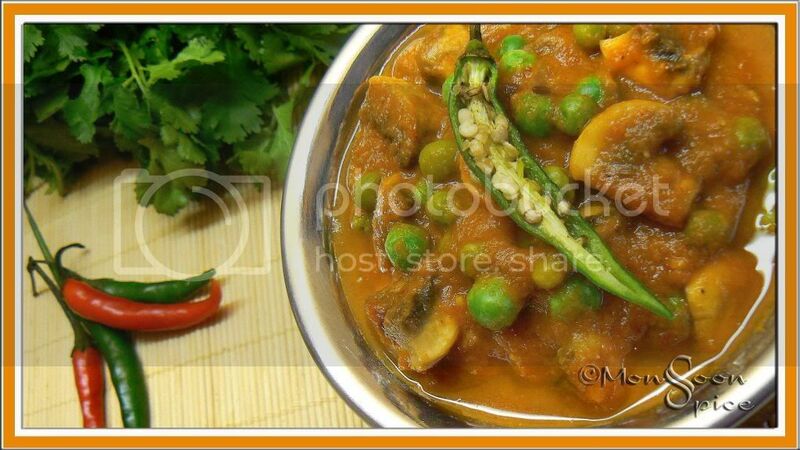 This is a rich, creamy dish of sweet green peas and delicious mushrooms cooked in wonderful gravy of onion, tomato and cream or milk. The ground onion paste along with ginger-garlic and red chillies gives a lovely creamy texture to the gravy and hence the cream used in it can easily be forgotten. Heat ½ tbsp of oil in a pan and add a tsp of cumin seeds to it. When cumin starts to sizzle and turn reddish in colour, add finely chopped garlic and ginger to it. Sauté on medium flame till the garlic turns light golden on the edges. Now add finely chopped onions and halved red chillies and sauté till onion turns light golden, about 2 minutes. Switch off the flame. Once the onion mixture has cooled a bit, grind it to a smooth paste without adding any water to it. Heat a tbsp of oil in a pan and add a tsp cumin seeds to it. Again when cumin starts to sizzle and change in colour, add ground onion paste to it and fry till the whole mixture becomes dry, about 4-5 minutes, on medium flame. Make sure that the ground onion mixture turns little brown in colour. Simmer the flame and let it cook covered for 10 minutes, stirring in between. Add little more water or milk if needed to get the required consistency of gravy and adjust the seasonings. Then remove the lid and let it cook for another 5 minutes for all the flavours to blend well. Serve it hot, garnished with finely chopped coriander leaves, with any Indian flat breads or flavoured Rice and enjoy. Haha ,I like ur venture in kitchen after tasting ur hubby cuisine! I make mush and mattar curry but ur's simply delish! Sia, can't believe that it is only a few years since you have started cooking. 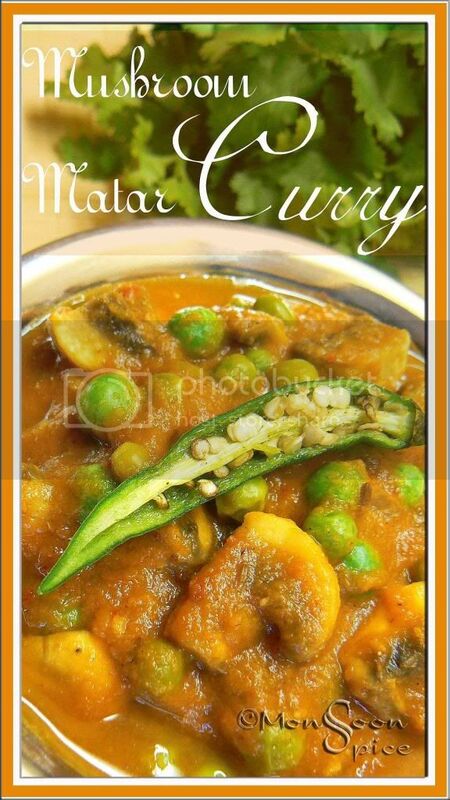 The mushroom matar curry looks delicious as always. Looks yummy Sia. My little girl loves peas unlike her mom when I was growing up. I'll try it out for her some time. I love mushrooms and I love cream..so this is my kind of curry..
looks fabulous.... mushrooms in anything is great, but in a creamy dish with peas is bliss!! looks awesome! mushroom n peas - a gr8 combo. Lovely pics too! Sups!! I was smiling when i looked at your post.. I never stepped into the kitchen till i got married.. pampered child u see..
Lovely ,and delicious pics as usual. I need to try out mushrooms with gravy... i always fry it dry & spicy..
oops i got carried away so much that i missed out creamy mushrooms...lovely recipe and tempting presentation ! Mushroom is something we love here exccept my daughter. This looks reall creamy. Yeah me too, i never cooked at home, helped mom out in dishes or with laundry, cleaning the garden etc.. but never cooked anything, except frying a omleette when i was really hungry and she was not home. I started cooking after getting married too. The curry looks lovely, Sia. Your story resonates with me because I too learned to cook only after getting married, but once I began, I never wanted to stop. Even at the end of a long and tiring day, cooking never fails to relax me completely. I have always been interested in cooking, but haven't had much opportunity before marriage. You have pretty much covered every girl's story here in terms of spending time in the kitchen. Mushrooms is not my favorite, but I loved the curry that you have prepared. very nicely written..i love mushroom and peas combinations, yummy recipe!! I'm a big fan of the Indian kitchen, and specially of yours.. All my family liked your meal, thank you for the recipe! What a wonderful and tasty recipe. I love peas and mushrooms together. The color is also very beautiful. Sia, hunger and lack of time drove me to the curry buffet at a local gourmet grocery today and I had my first taste of mushrooms in a matar curry. I first thought the flavor odd, fungus among the flowers, you know, but it quickly grew on me, and I knew I had to find a recipe. Your ingredients are wonderful, the method easy, and your curry is far prettier than the grocer's. I'll try it this week. Thank you. And, oh, even as a young boy I spent long, happy hours in the kitchen with my mother. Now I am the (almost) sole cook in my household. My hard-working wife doesn't seem to mind! Lastly, your blog site is nicely done--I dug in a little. Now, I just subscribed. Thanks again. Michael, Welcome to Monsoon Spice. I know mushrooms in a curry with greens peas might sound bit unusual but the end result is always a pleasant surprise for many friends of mine. And it is also true that either you will fall in love with it or simply hate:) We Indians have been using the wild mushrooms which grow during monsoons and there are some mushroom curries from my native which has freshly grated coconut in the gravy. I hope you give this curry a try and see how you like it. Sia, this dish came out so gooood today that me and my husband were licking our fingers! :) Thanks for the wonderful recipy! OMG...your recipe is fantastic! i just tried it out today, and added some cashewnut paste to t gravy...it is absolutely delicious! my father in law who never eats mushrooms gobbled up half t dish! :D thanks a lot! Thanks for your recipe.It came well.